JULY 3D MUG SET WITH LATTE SPOON! Birth flowers and Gems on a clever round cardstock mug with gift card envelope, tea bag packet, tea bag tags, labels and gingham pattern paper PLUS cute latte spoon through the handle just like porcelain ones! Included too, is an extra handle studded with gems stones and slsto cut for the spoon. 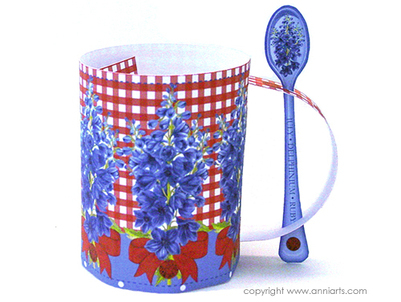 Use the pattern paper as inside of the mug by printing the page first, then print the mug on the reverse. The inside of the mug then has the gingham pattern. Or wrap a small gift, use as card backing etc. Four latte spoons have different messages or a blank option. Do you like your flower and gem? Should I add items? Leave a comment below & connect! 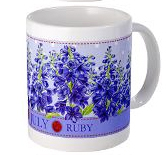 Would you like a real ceramic mug featuring a coordinating design? There are pretty ready-to-order mugs here!